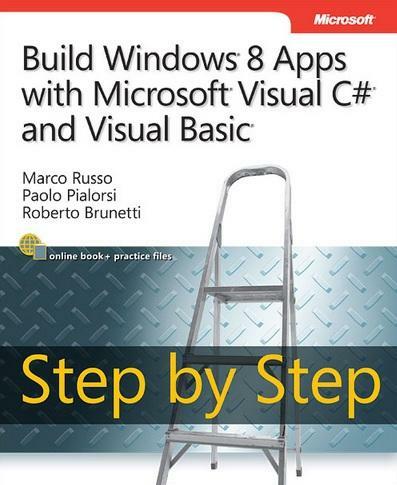 The title of the book is- Build Windows 8 Apps with Microsoft Visual C# and Visual Basic Step by Step which is written by very famous group of authors- Marco Russo, Paolo Pialorsi, Roberto Brunetti. This book has been written keeping in mind that you will be able to learn yourself. You will be able to learn how to build Windows 8 Applications by reading this book. As the name says it is a Step by Step book which will allow you to learn by making small applications, by doing different exercises given in this book. You will learn to build Windows 8 applications in the .NET Framework 4. You will able to learn how to build Windows 8 Apps with Microsoft Visual C# 2010 or with the Microsoft Visual Basic 2010. Build Windows 8 Apps with Microsoft Visual C# and Visual Basic Step by Step book is best suitable for the intermediate in .NET technology. You can learn how to build Windows 8 Apps for Tablets, Desktops, Laptops and slates in this book. It is a very good book in terms of self learning. The publisher of this book is Microsoft Press. Microsoft Press has published this book and we all know that only the best books are published by them. This book consists of 400 pages. The release of this book is currently scheduled in December, 2012. But it is an estimate its content depends on the final release of Windows 8, so the release date of this book can be changed later. You can currently Pre-order this book at Amazon.com in 30.80$ only with their price guarantee. Amazon is providing best price to the customers who are Pre-ordering this book. It means that if the price of this book will increment after the release of Windows 8, then you don't need to worry about it. You have to pay the cheapest or lowest price which will be offered by Amazon.com between the time of your order placed and end of the day of release date. Note: Price Guarantee is only available at Amazon.com not in Amazon.uk and other sites of Amazon. Marco Russo is a Technical author, consultant and trainer. Various books written by him are mentioned here. This is an article which talks about the fabulous XPS format from Microsoft and the viewer software which comes with Windows Vista and Windows 7 and surely gives a competitive hit to Adobe's PDF.